The Cholamandalam General Insurance company provided different ways of Chola MS Online Payment Process. All the Policyholders of Chola MS General Insurance can use the given Online Payment Methods to save money and Time. Login Option, Policy Renewal, Buy New Online Policy are the different ways of Chola MS Insurance Online Payment. Customers who are interested in Online who use the internet frequently can pay your Policy premiums by using the Online Payment Process. We have given the detailed process of each & every Online Payment method on this page. Therefore, the Policy assured can follow the given Online Payment steps and pay their Premiums using the Internet. The Cholamandalam General Insurance Online Payment helps the insured to pay their policy premium online. Chola MS Insurance Payment Online helps the customers to buy new policies, make premium payment and policy renewal through online who are interested in it. Any Chola MS Policy Holder can pay premium through Online Premium Payment service which provided by the Chola MS General Insurance. With the help of Online web portal, the Chola MS Insurance Company has made the easy process for Policy renewals, Premium payments & buy Online Policy. The Policyholders can buy the Chola MS Health Insurance Policy through Online. Pay the Chola MS General Insurance Online Payment by following the provided steps below. To buy a New Policy through Offline, Customers need to go to the branch office. Many people think buying a Policy through Offline is a waste of Time. So that they can buy a Policy through Online from the Official Website of Chola MS Insurance company to save time. 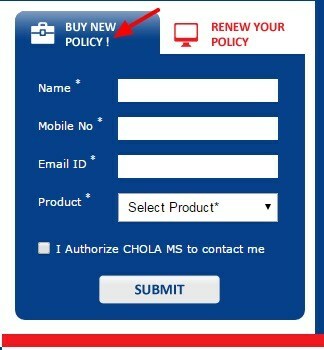 How to buy a new Chola MS Online Policy? Visit the official website of Cholamandalam General Insurance i.e., www.cholainsurance.com. Find the Buy New Policy Option which is at the Righ of the Home Page as shown below. Fill the Form with required details in the Space Provided there. There you have to select the Product given there. For example, Select the Car Insurance Policy for Chola MS General Car Insurance Buying Policy. Once you enter the details then click on the Submit Button. Then you will direct to the Buy Motor Insurance Page as shown below. Select any one of the options based on your category provided there. If you select on Insurance for a new car, then you will direct to the new page with a new application form. Enter all the required details to create your account. Enter your invoice details and also a registration no. Fill all your Personal details for Chola MS Online payment. After entering all the details in the new form click on the Proceed. Now you can see the Chola MS Online payment details. The Policyholder of Chola MS General Insurance can pay their premiums through Debit/ Credit cards. Finally, your policy will be issued/ renewed. A confirmation email will be sent to the insured email Address by Cholamandalam MS General Insurance Online Payment. The Cholamandalam General Insurance Assured can also renewal the Policy through the Chola MS Login. The Cholamandalam General Insurance Online Renewal Process given below for the customers through the Login Process. The Policyholders need not visit the branch offices to renewal their Policy. For the Policyholders, the Chola MS General Insurance Company has given simple Steps to renew your Policy through Online mode. The Cholamandalam Policy assured has to visit the Official website. Find the ‘Renew your Policy‘ Option which is at the Right of the Home Page as shown below. Now Click on the Renew your Policy option shown in the above image. Then you will direct to the Page as shown below. Enter your User Name and Password in the Space Provided there. Once you enter the details, click on the Submit. 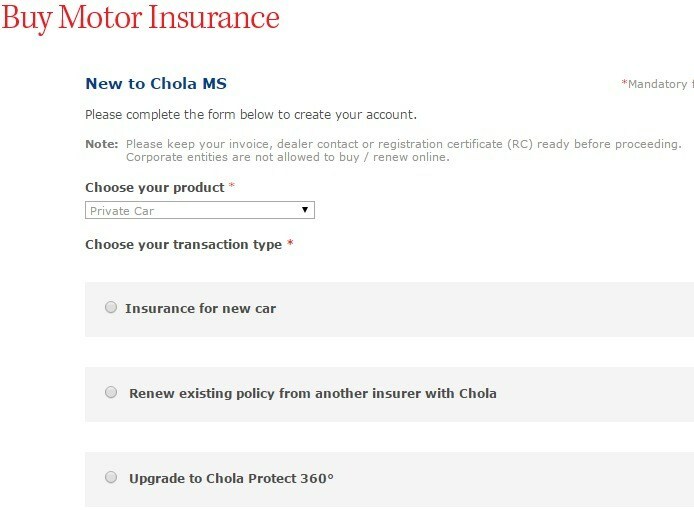 Now in your Policy account, you can Renewal your Chola MS Insurance Policy there. If the Policy Insured is a new user and Don’t have a Login account, then click on the Register option in the given above image. As soon as you click on the Register option then you will direct to the new page having Registration Form as shown in the below image. Enter all the required details in the space given there. Once enter all the details in the form, Click on the Register. Now Policyholders can Login to their Policy account with the registered User ID & password. So that you can renew your policy from your Policy account. The Policy Assured can also renew their Policy through Offline. Visiting the Chola MS branch Office to renew Policy is an Offline Method. After Visiting the branch Office submit all the required details regarding your Policy to the Officers. And now you have to pay the amount to renew your Policy. Then they will renew your Policy & start your Policy as usual by paying all the premiums. Therefore, follow all the given Steps on this page for the Chola MS General Insurance Online Payment.